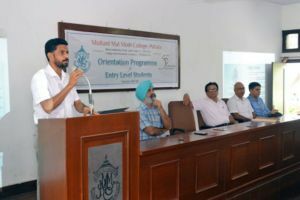 M M Modi College, Patiala commenced 2017-18 Academic Session by organizing Two-day Orientation Programme for the entry level students. Principal Dr. Khushvinder Kumar welcomed the students. He told that sometimes new students coming from the schools face many difficulties in the new environment of the college and that is the reason various committees have been formed here to assist and guide students. He said that M M Modi College has been serving the cause of higher education for the last 50 years and is now counted among the top colleges of northern India. He urged the students to become responsible citizens of the country and put their best efforts to participate in the growth and development of the nation. Vice-Principal Prof. Nirmal Singh spoke about the evil of ragging and asked the new-comers to report any type of indecency from other students immediately to the authorities. Prof. (Mrs.) Poonam Malhotra informed the girl students about the functioning of the college Women Cell. Prof. Sharwan Kumar gave detailed information about the Time-Table. 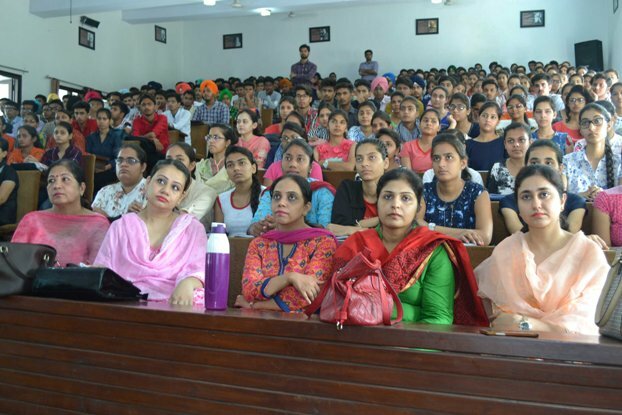 Dr. Manjit Kaur apprised the students about the co-curricular activities organized in the college. Prof. (Mrs.) Baljinder Kaur advised the students to plan their creative writings for the college magazine ‘The Luminary’. Prof. Shailendra Sidhu, Dr. Neeraj Goyal and Prof. Vaneet Kaur informed about the Add-On Courses. Prof. Ved Parkash talked about NCC, Dr. Gurdeep Singh and Mr. Nishan Singh explained the achievements of our sports persons, Dr. Ashwani Sharma gave information about the Eco Club and the Science Fair. Dr. Rajeev Sharma and Prof. Jagdeep Kaur laid emphasis on NSS activities. Prof. Vinay Garg discussed the student information system functioning in the college. Dr. Ajit Kumar informed the students about various academic and co-academic programmes listed in the annual academic calendar. He also made the students aware about the conditions of house examinations and requirements of class attendance. Prof. Ganesh Sethi talked about various scholarship schemes, Prof. Harmohan Sharma informed about various clubs and societies functioning in the college. Prof. Rohit Sachdeva apprised the students about the placement-cell available in the college. The response of the students was very encouraging.